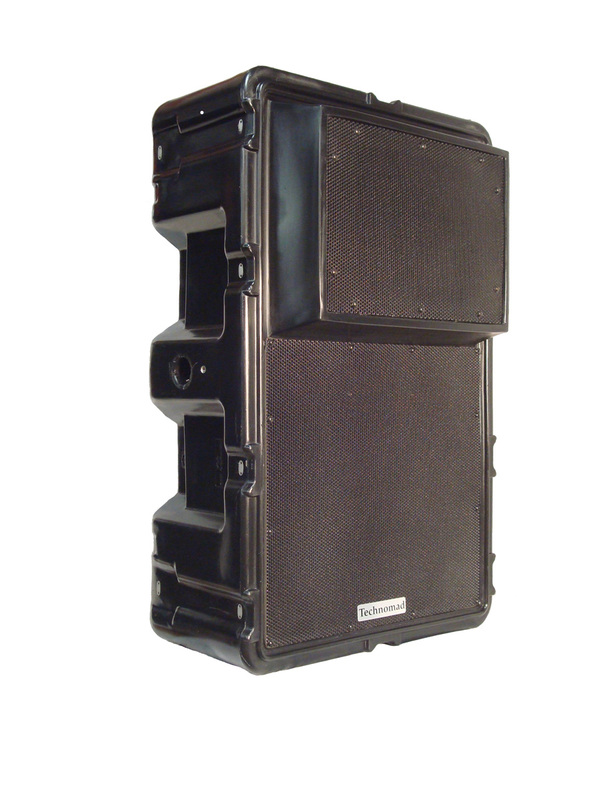 Technomad LLC, a leader in weatherproof loudspeakers and audio systems since 1995, comes to InfoComm 2009 (June 18-20, Orange County Convention Center, Orlando, Booth #5940) with renewed momentum as the company expands into new territory based on game-changing products for the general AV, systems integration, education and commercial security markets. New this year is the Berlin range of narrow dispersion loudspeakers, available in two configurations (90×40 and 60×40).The new models retain the outstanding durability, voice intelligibility musical audio quality and long-distance output of traditional 120×120 Berlin loudspeakers; while giving design engineers, contractors and consultants seeking a more controlled output pattern.Ideal for tightly controlled acoustic environments indoors or in outdoor installations where long distance projection is required — especially large stadiums — the Berlin narrow dispersion loudspeakers will be displayed at InfoComm 2009 for the first time. At InfoComm 2008, the company introduced two products that saw the company build on its traditional product range: The Schedulon, an automatic mp3 player and recording system; and the PowerChiton range of compact, durable and weatherproof NEMA power amplifier modules.Now shipping worldwide, Technomad announces a series of upgrades to both products that will appeal to new and traditional markets that the company has served for nearly 15 years. The Schedulon™ is ideal for use in themed entertainment, high-quality music playback, simulated environments, sports, schools and universities, and commercial security applications.The Schedulon provides instant, manual playback of up to 99 knob-assigned, user-loaded audio files from a front-panel screen, and allows automatic playback on a user-defined schedule based on an internal clock or synchronized network time server. For InfoComm 2009, Technomad announces a new internal power backup option that provides redundancy in the event of power loss.The new internal power backup option provides a battery for up to 20 minutes of audio.The battery also keeps any scheduled playback events on target for approximately 75 minutes.The Schedulon immediately ‘wakes up’ at the current time to resume playback of all scheduled content after battery power expires and the unit is restarted. PowerChiton modules unite a high-performance, passively-cooled amplifier with an IP66 rated, low-profile enclosure.The powerful combination offers system designers and installers a flexible solution for the many challenges of distributed outdoor audio system design.For InfoComm 2009, Technomad has added a series of new upgrades that includes IP and RF networking options, an internal mixer and additional input options. Widespread wireless networking using FM audio distribution technology, suitable for facility-wide audio distribution that requires only local AC power to operate the unit. Ethernet networking capabilities can be used for wide-area distribution on a campus or facility LAN with options for zone control. Traditional twisted-pair networking can be implemented for very long-distance distribution over copper cabling with minimal signal loss or noise. Technomad has also added two standard inputs to all three power levels of PowerChiton modules: a high-quality line level input for improved site-wide audio that is ideal for both voice (paging) and musical output; and a second input that can be used for local audio or as a secondary audio source.An internal mixer has also been added to balance, improve and maintain audio levels out of the amplifier modules en route to loudspeakers.